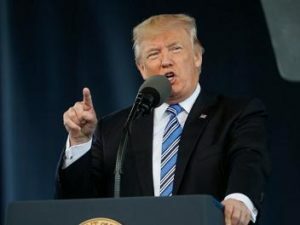 Readers who attempted to share a story in the May 14 edition of WorldTribune.com about President Donald Trump’s commencement address at Liberty University have been unable to do so other than by posting a link to the story. The story, ‘Never, ever give up: Trump tells grads to challenge evil and worship God, not government,’ is not the first article at WorldTribune.com to encounter such blocks. Editors said the blocks would sometimes be placed on articles with apparently controversial tag words for a few hours but would then be lifted. The block on sharing the Trump commencement address article remains in place a full 24 hours after its publication.